The Genezik software, conceived by researchers from the Signal Processing Laboratory at EPFL (LTS2), offers an innovative approach to playlist making and to rediscovering forgotten songs. This is one of the inventions that EPFL will be presenting during the Montreux Jazz Festival. A digital music library can easily begin to look like a jungle after having downloaded thousands of tracks over the years. It is so much so that, out of comfort, we often end by listening to the same customary playlists. 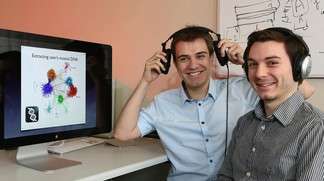 Genezik, a piece of software invented by researchers from the EPFL's Signal Processing Laboratory (LTS2), proposes to guide listeners in the exploration of new musical avenues and help them rediscover their own music and forgotten pieces as if listening to them for the first time. This is one of the inventions that EPFL is currently presenting within the framework of the Montreux Jazz Festival. The general public will be able to test it in the "Chalet d'en bas" through 15,000 musical pieces from the festival archives. Mainly, what makes this program original is its possibility to create musical paths. It determines which pieces to put together when, for example, gently taking the listener from good old Aretha Franklin to Daft Punk, or even from a Mozart piece to Metallica. After choosing a single song, it creates a coherent route among tracks whose properties have been determined to be similar with regards to scientifically established parameters. "When cataloguing music, most of the programs currently used are based on tags or user reviews, explains Kirell Benzi, Genezik creator with his colleague Florian Carrere. Then again, a band like Led Zeppelin, for example, is generally classified as hard rock, but some of their songs, including "D'yer Mak'er" are much closer to Bob Marley! Our program can easily identify it as such. " Genezik's concept lies in combining a thorough computer analysis of music signals and each user's musical "DNA". For each song, the software dissects data such as its rhythmic structure, timbre, harmonic progression, notes, their sequence, the spaces between them, disharmonies, and so on. Based on the "graph theory" each piece is represented by a node in a graph. All nodes are grouped and connected according to their similarities and they form sorting clouds under the categories of "rock", "pop", "jazz", etc. Consequently, each user's musical DNA is gradually deciphered through automatic learning algorithms based on their listening habits. To integrate a human dimension to the listening process, the software is then able to record the listener's instructions, who at any time can indicate whether she/he likes a transition between two songs or not. In this way, the system will consider this information in its subsequent proposals and, as a result, it gradually refines and customizes its suggestions. Additionally, the software comprises a social dimension as different users' graphs can be connected to each other and form a network, enabling them to recommend songs to discover to each other. In the coming months, Genezik's creators will put a start-up together and launch an application for mobiles and tablets. They also plan to develop their system to create playlists tailored to specific activities such as jogging, concentrating, relaxing etc.